Fighting out of Houston, Texas, United States, Derrick “The Black Beast” Lewis, 33, won in his most recent bout in the Ultimate Fighting Championship. It was his 12th victory in the promotion. Featuring 12 mixed martial arts matches, the UFC held “UFC 229” at the T-Mobile Arena in Paradise, Nevada, United States on October 6, 2018. In the ninth bout of the evening, Lewis competed in the heavyweight division against Alexander “Drago” Volkov, 29, Moscow, Russia. Referee Herb Dean put a stop to the heavyweight bout between Lewis and Volkov at 4:49 in the third round. The fighter from Houston knocked out his Russian opponent via punches. “UFC 229” marked Lewis’s 15th UFC bout. The first opponents he defeated were Jack May, Carlos Augusto Inocente Filho, Ruan Potts, Viktor Pesta, Damian Grabowski, Gabriel Gonzaga, Roy Nelson, Shamil Abdurakhimov, Travis Browne, Marcin Tybura and Francis Ngannou. 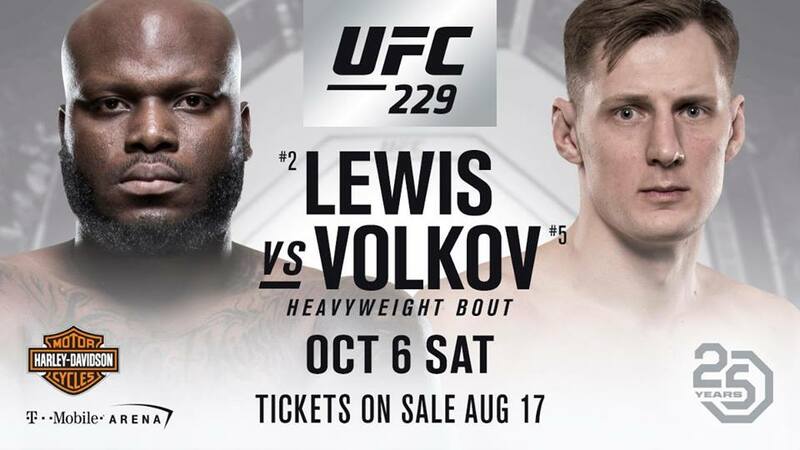 By defeating Volkov at “UFC 229,” Lewis improved his professional mixed martial arts record to 21 wins and 5 losses. On the other hand, Turner’s record downgraded to 30 wins and 7 losses. In the co-main event of the evening, Tony “El Cucy” Ferguson, 34, of Oxnard, California, United States and Anthony “Showtime” Pettis, 31, of Milwaukee, Wisconsin, United States competed in the lightweight division. After two five-minute rounds, the Californian contender was declared the winner via technical knockout corner stoppage. In the main event, Khabib “The Eagle” Nurmagomedov, 30, of Dagestan, Russia defended his UFC Lightweight Championship belt for the first time. Former champion Conor “Notorious” McGregor, 30, of Dublin, Ireland challenged the Dagestani reigning champion.